To the east of Kishtwar are the snow-clad mountains of the upper Himalayas - the rivers of Zanskar, Suru, and Drass rise from these snows, and flow across the plateau of Ladakh into the Indus River. Several petty principalities in this region were tributary to the Gyalpo (King) of Ladakh - in 1834 one of these, the Raja of Timbus, sought Zorawar's help against the Gyalpo. Meanwhile the Rajput general had been burning to distinguish himself by expanding the kingdom of Raja Gulab Singh , also at that time, according to the Gulabnama, Kishtwar went through a drought that caused a loss of revenue and forced Zorawar to extract money through war. The sapphire mines were discovered around late 19th century and lie 6 Kms , NW of Machail. Aim of the trek:- To identify, explore and extensively document this historic route, so as to promote this part of the world, at national and global level, as "The Sapphire Trek". 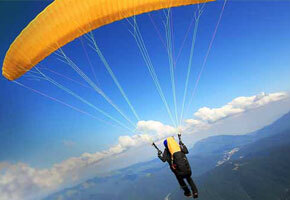 The route is also the gateway to the famous Sapphire mines in the Paddar area and hence the name. The mountain valley of Himachal Pradesh towards the northeast captures a mountain kingdom of Lahaul, Spiti and the tribal belt of Kinnaur. 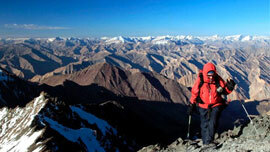 Mountaineering on these peaks is just awesome, as these exquisite haunts are less explored. Uttaranchal another hilly state of India facilitates mountaineering opportunities with some of the beautiful peaks idle for climbing. The place is also a derivation of the Ganga, one of the holiest rivers of Hindus, it is also a destination for pilgrims, trekkers and rafters. 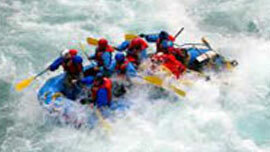 If you are a normal healthy person and without any fear of water, then rafting can be your sport. One can become a skilled rafter in just a few hours of training and the rafting training facilities exist in different parts of India. 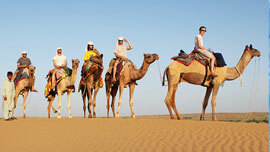 Many tourist agencies and state departments also conduct courses in river rafting. Carry dry bags dry bags or boxes to secure small personal items you may bring with you and it usually also have room to accommodate an extra layer of clothing. Be sure to take any necessary prescription medications such as inhalers, bee-sting kits, insulin etc. Avoid taking your car keys, wallets, cell phones etc. with you for the rafting trip. Also take along sunscreen, sunglasses with a strap to secure them and a camera. Disposable waterproof cameras are easily available, easy to take along with you and take good quality pictures. 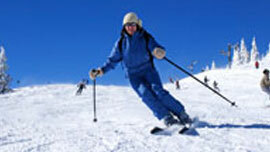 Skiing, as an adventure sport, has come a long way in India. Introduced by the Europeans, it started out as a purely elitist sport, which provided the foreigners an adventurous respite from the heat of the plains. However, it has today become a sport of the common man. People from within India as well as all around the world flock to the country in large number to enjoy the pleasure of skiing. Moreover, the slopes in the skiing destinations in India give you an opportunity to enjoy both snow skiing as well as heli-skiing. In snow skiing itself, you can enjoy both Alpine and Nordic. This means that you can slide downhill in a straight route as well as in a zigzag course, jump from an elevated position, or for extreme adventure, hire a helicopter and have yourself dropped on the snow clad peak itself. 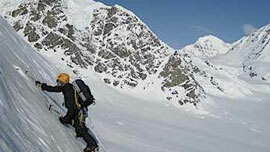 From there, the fun and adventure of skiing downwards it enhanced multifold. Assistance for skiers, in form of equipment, trained guides, pilots and even short courses are available, in an attempt to give them an unmitigated sense of joy when they come to India. So, next time when you feel like running down a snowcapped hill slope with cool icy breezes hitting your face, just think of India. It is here that you will have some of the best moments skiing down the snowy slopes.Skiing is one sport that has gained immense popularity all over the world and in the past decade have become quiet attention grabbing sport because of the Himalayas.. The vast open spaces above the snowline have flung open to the skiing enthusiasts.